Kona Plaza#217 AMAZING LOCATION! IN HEART OF KONA TOWN! AC & Elevators! 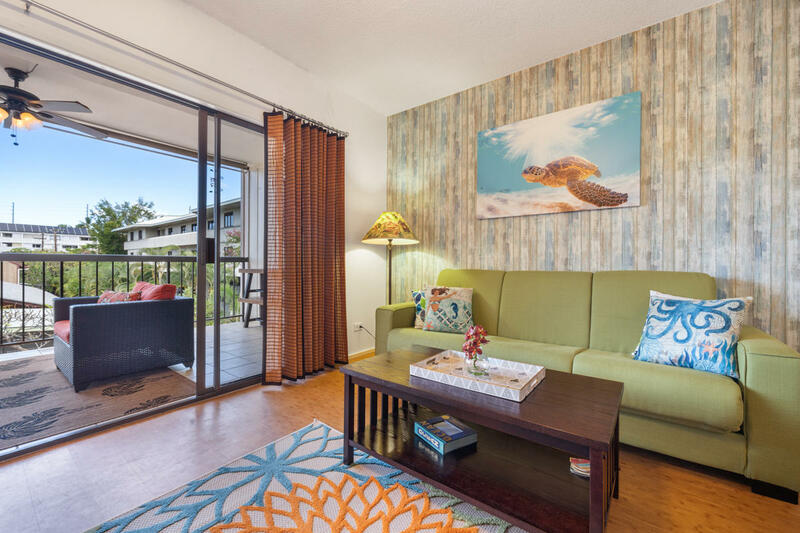 Don’t miss this fabulously updated Kona Plaza vacation rental. Condo #217 is newly available as of January 2019. It's amazing location right in the heart of Historic Kailua Kona Town makes this condo by far one of the most desirable condos around. TAKE A VIRTUAL TOUR OF THE PROPERTY! SEE LINK IMMEDIATELY BELOW! 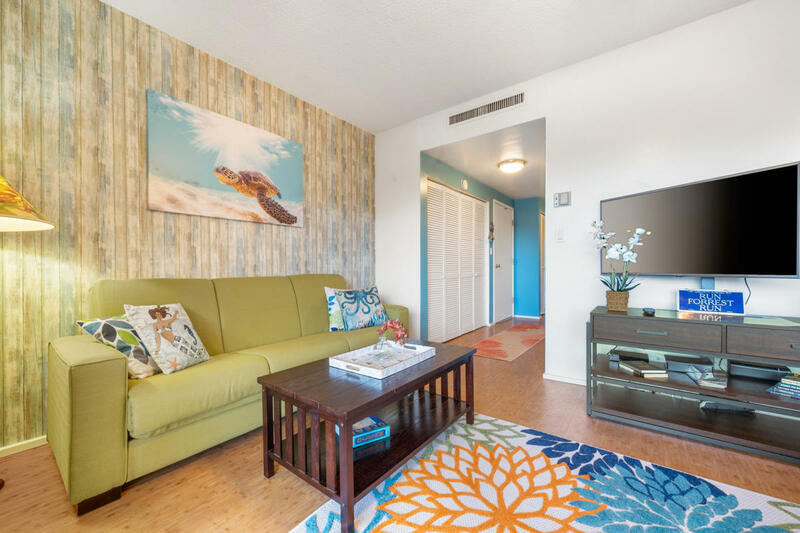 This vibrant and colorful, 1 bedroom, 1 bath condo sleeps 4. There is a Queen Size Bed in the bedroom & a Sleeper Sofa in the living room. You can keep cool with Central Air Conditioning, enjoy the comforts of home with Wi-fi Access, Washer/Dryer, Fully Equipped Kitchen, Two TVs located in the living room and bedroom, Elevator Access & Underground Covered Parking. 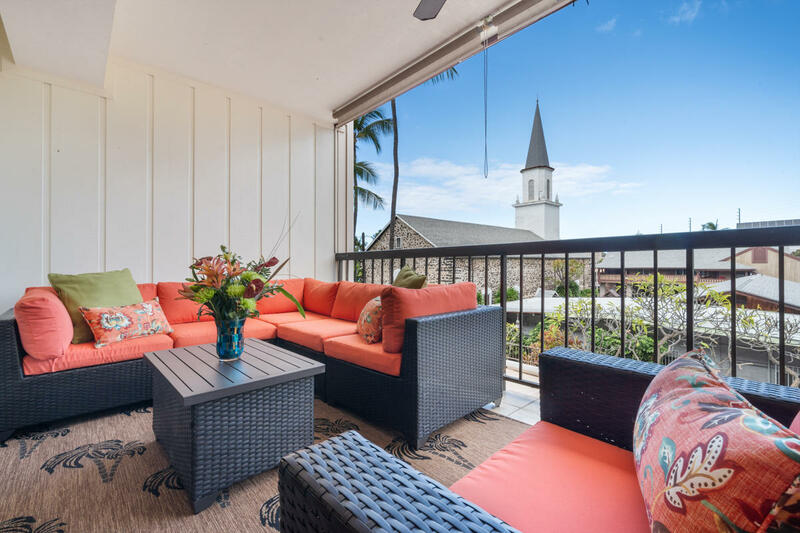 The spacious Lanai affords many opportunities for gazing with amazing views of the Historic, Mokuaikaua Church and gardens completed in 1837! Expansive sliding doors entice the fresh tropical air and sunlight into the living room, bringing the outside in. Relax and enjoy the peace and tranquility. Kona Plaza Condominium Complex has a brilliant and inviting pool with lounge chairs so you can just chill out and catch some rays, plus 2 BBQ decks with great views of the ocean/mountain. Nestled in the heart of Kailua Kona Town off Alii Drive, there are a plethora of restaurants, shopping and attractions within walking distance. Check out these delectable restaurants: Pancho & Lefty's Cantina, Fosters Kitchen, Huggo’s on the Rocks, Kona Inn, Kona Canoe Club, Jackie Reys, Bongo Bens, Umeke’s Fish Market, Big Island Grill, Original Thai, Keoki's Fish & Chips, Kria Thai , Noodle House and MANY MORE!! For a night cap or enjoying the local nightlife check out Sam's place (Karaoke every night), MY BAR & Nightclub - LGBTQ Friendly Hot , Don’s Mai Tai Bar, Gertrude’s Jazz bar, Kava Bar, Humpy's and more. The Scenic Kailua Bay and pier is just 500 feet from your door. How fabulous is that? The Pier is where most of the boat excursions on the Big Island's west coast depart (snorkel, whale watch, dinner cruises, etc.). You can also rent any toys you need for enjoying the beach and ocean. Kailua-Kona Beaches, Snorkel Bob's. Other unique and fun activities include, Octopus Farm, Seahorse Farm, Mauna Kea Volcano and City Of Refuge. Major grocery stores, Island Naturals, KTA Superstores, Longs drugstore (CVS), gas stations, Costco, and Target are a short drive away. There are many wonderful coffee farm tours where you can see how the world-famous Kona coffee is cultivated. Mountain Thunder, Hula Daddy, Kona Coffee Living History Farm and many more. Don’t forget the famous Macadamia Nut. Check out these factories. Hamakua, Dr Paulo's Kona coffee & Mac Nut Farms, and Mauna Loa. Knutson & Associates Property Management is newly representing this property as a brand new Vacation Rental! Be one of the first guests to enjoy this vibrant and charming property! 9. Kona Plaza is straight ahead!! **If entering address into GPS, please search for "Kona Plaza" instead of the unit's address. The condo is in a great location - walking distance to wonderful restaurants, shopping, and the beach. What more do you need?! Quiet location, great amenities, and parking included. We had a great time in Kona - hope to come back soon! We had a wonderful week in Kona. This condo was within walking distance of many great restaurants, shopping and entertainment. The condo is well-stocked with all the beach items you need. (Nice beach chairs, snorkeling gear, bogie boards, sun umbrella and even a cooler)! Kona Plaza has one pool and two sun decks with barbeques. On one of the sun decks has a book library. There is also secure parking if you rent a car. Knutson & Associates is a mid-sized, independently owned company consisting of dedicated professional Realtors®. Our offices are located in Kailua-Kona, on the Big Island of Hawaii. Our licensees have extensive experience in residential and investment brokerage, and look forward in assisting you with all of your real estate needs. We are backed by our management team with decades of experience in all phases of Hawaiian real estate and are currently celebrating our 42nd year in business here in Kailua-Kona in 2018! Kona Isle B31 Top Floor, Oceanview, & AC!! !